10 Home and Garden Hacks for DIY this Spring! I don't know about you, but there's just something about Spring that always makes me feel more productive and want to whip out my paint brushes, gardening tools and even cleaning products in a kick of energy to just get stuff done! But time is precious as they say, and money doesn't grow on trees, so for that reason I love a good hack. They can make life so much easier and/or cheaper... And with tons of plans for the next few months, I thought I'd share some of our home, DIY and garden hacks as part of the #MightiHacks Challenge, that we've used around the home (or intend to!) to make our life just that little bit easier (and cheaper too!). When people think of screening ideas for privacy in the garden, they often think of hedges or fences. But hedges can cost a flamin' bomb and they take forever to grow and fences aren't exactly an easy option either. For affordability and super quick screening on the cheap, climbing plants and bamboo are a great hack alternative, both of which we've used in our garden. Or if you're feeling a bit more creative, you could create your own screening out of pallet wood. Simply cut to size, join together with rope and support! You can see a tutorial on how we did this ourselves here. Whilst we're still in the garden, let's talk about storage. I don't know about you, but we don't have a garage or a shed to store all those endless garden tools. Where does it all go? Well, for us it's one giant pile taking up half the conservatory. A clever DIY-solution and hack is to integrate hidden storage where you otherwise wouldn't usually. Something we'll be doing later in the year is building some decking with, you guessed it - storage underneath! It's the perfect solution for hiding garden stuff. By adding some hinges to a couple of deck-boards or simply leaving a couple unsecured means you can easily access the void underneath and stow away those random plant pots and garden tools. We actually intend on storing ladders in ours and will be doing just this in a couple of months. Imagine how annoying phones would be if they were all still corded? Simplify your life and go cordless, wherever you can. We've recently purchased a new cordless drill and I can't tell you how quicker and easier my life now is. No more extension leads or restrictions! AND they take less room to store. Garden tools in particular can be a right nightmare when it comes to cables though, especially considering their ridiculous length.. Although anyone else find they're still just not long enough? And who really has multiple plugs in their garden? Not me! I often need to use an extension lead on an extension lead. Safe yeah? Go cordless. 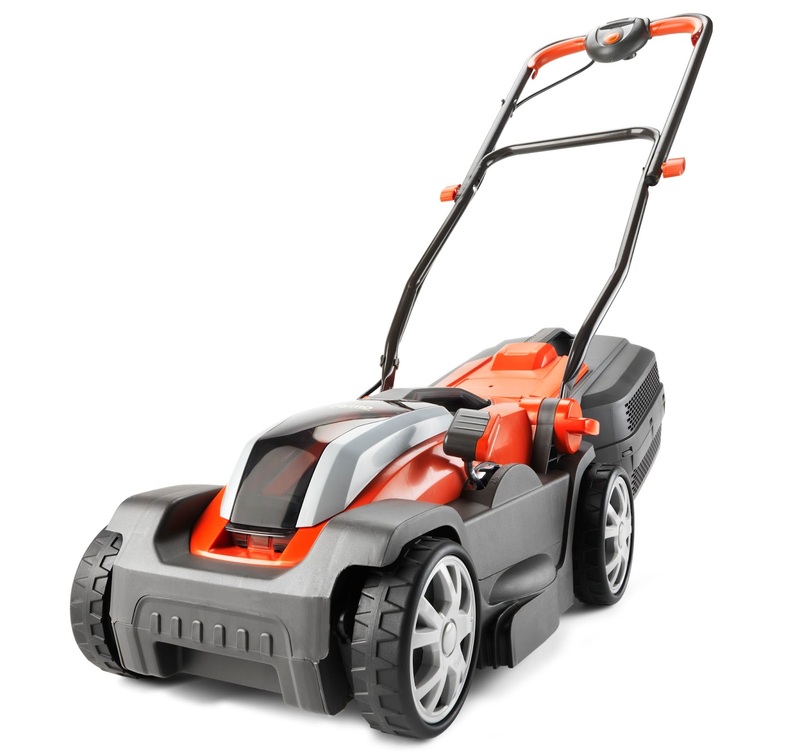 Even larger garden tools like Flymo's new MightyMo lawnmower is now cordless, making it super quick to whip it, mow the lawn with and then put away. No nightmare cables, saving you a whole load of time and effort. It's also lightweight and compact, perfect for storing in small spaces too. Whatever electronic we buy nowadays, especially in the garden and DIY - we always try to go cordless. It'll change your life... almost! I am the absolute worst person for not cleaning tools when they're not in use. Whether it's a bucket, a trowel or a paint brush - apparently I'm just lazy and muck ends up drying on and becoming a nightmare to remove. When it comes to painting though, there's an easy way to stop your paint brushes from drying out and being forever covered in thick dried-on paint. Cling film! Wrap up paint brushes, rollers and paint trays when not in use and they wont dry out! You can leave them for several hours, even overnight and guess what - no dried-on paint! It's amazing and an absolute essential hack when you have to wait in-between coats to use the brush again! If your home suffers from some dodgy plastering, there's an easy solution without having to fork out hundreds for a plasterer. Lining paper! It's basically a very thick wallpaper than hides imperfect plaster and provides a suitable surface for painting straight onto. If fitted correctly, you wont see the join and it should be almost invisible. It's DIYable, costs a heck less than plastering and much faster than spending hours sanding walls that may never achieve the look you so want. You can of course use normal wallpaper over the top as well! Grouting Tiles? Use a grout bag! As you'll know if you follow me on instagram (find me here!) we've been desperately trying to finish off our kitchen renovation and one of the jobs we had left to do was grouting. I've tiled a fair few different rooms now and have now pretty much nailed the art of tiling. But for me, the worst part of tiling is grouting. You basically smear grout all over your perfectly clean tiles and then have to race against the time to clean them up before the grout dries, but also not too soon, so not to damage your new grout lines. It's a right old bugger. But, last year I discovered the invention of a grout bag. It's basically like a piping icing bag, but for grout. You can fill up the grout lines without smearing it all over tiles, so you barely have to do any cleaning. And it's totally hackable as you can make one yourself out of a rubble bag, like we did when tiling around our new log burner (you can see that post here). Get creative with leftover tiles! To add to the similar topic of tiles above, don't throw away any offcuts of tiles. These can be cut down and used as coasters, or they can be used in the garden over borders, or even up-cycling old furniture. There's literally so many uses for spare tiles - keeping them out of the bin may save you some money in the long run. You can check out our DIY tiled table here. This is another one we're using ourselves very very sooon! Kitchen units can cost far more than just an arm and a leg (lungs, heart and soul too probably!). Basically, they are by no means cheap. If you're renovating and going for a new kitchen but on a serious budget - instead of getting wall cabinets, you can up-cycle old floorboards, re-use aged timber or just go to ikea and use some shelving for an exposed-look instead. Kitchen shelves can make a great feature - we used them in our old house and intend to do the same here too. They're also much quicker to fit and if you change your mind you can always upgrade at a later date. Since we're on a Spring vibe, I thought I'd include a couple of cleaning DIYs as well. Instead of splashing out on fancy drawer smellys or expensive long-lasting washing scents, you can create your own long-lasting smellys with just some wrapping paper and scented oil mixed with water. Spray the oil onto the wrapping paper and place them in-between piles of clothes in drawers. They'll keep clothes fresh and stop them from developing that musky sat-for-too-long smell. And even better, it costs virtually nothing to make! Another cleaning hack, but this one's for the log burner. I'd read this suggestion in a few places but disregarded it on it sounding a bit stupid. But after someone suggested this one to me directly on the blog, I knew I had to give it a whirl. Instead of splashing out on expensive glass cleaner or spending hours scrubbing away the soot on your log burners glass, just dip a wet bit of newpaper into some ash and you'll be absolutely amazed at how quick and easy it removes the black soot. Whoever discovered this needs to win some kind of award, seriously. Sounds a bit of a hippy method - but it really does work!! So there's a few different kinds of hacks for the house and garden this Spring if you too are feeling energetic and on a mission to "get stuff done"! I'd love to know any Home, Garden or DIY hacks you have :) We're always looking for ways to make our lives easier! Amazing Home & Garden DIY ideas for Spring. Such a creative post.